The 1960 Chevrolet Impala Convertible was a beautiful example of automotive design. It did not completely depart from the look of the ’59 Impala but did seem to take a new path. Chevrolet enthusiasts all have their own special year, yet the ’60 Impala seems to appeal to everyone. It had all the ingredients to build a name that prevailed in the American automotive market for decades. It also fore-shadowed the American muscle car scene as its appeal to a younger baby-boomer generation cannot be denied. 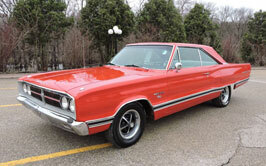 So it is with much fanfare that KC Classic Auto introduced a new listing yesterday. 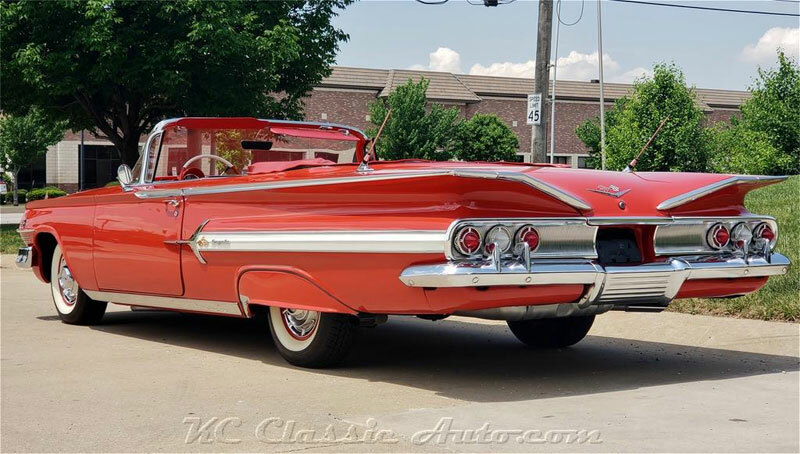 A red 1960 Chevrolet Impala Convertible appears in the Cars-On-Line.com newsletter as a fresh listing in the collector car community. Look through the photos in their ad to view some of the numbers they use to document the car. They do not have paperwork on the car or the motor but the 348 ci V8 in the photos looks right and it has the correct Tripower with correct air cleaner. The car comes with power steering, power brakes and power convertible top. The interior is done in the very desirable red houndstooth upholstery. Overall the car and paint are gorgeous. There is a lot to like here. In 1960, the Impala became the best-selling automobile in the U.S., a position it would continue to hold for the next decade. Total production for 1960 Impalas was 511,925. It was the “luxury” leader among cars you could buy for around $3,000. In fact, you could order Speedminder and cruise control, options never before offered on a medium-priced automobile. Chevrolet historians consider the 1959 and 1960 models to be the second generation of Impala. They created a roof line which was three inches lower, with the body two inches wider. They also used a new X-frame chassis. 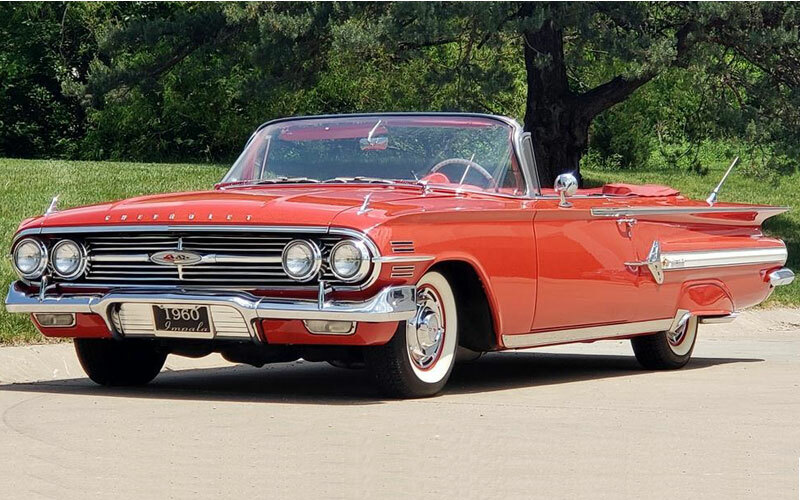 Although the 2-door hardtop 1960 Chevrolet Impala models (of which there were 204,467 produced) are very popular, the convertibles are by far the most valuable. Only 79,903 Impala convertibles were produced by Chevrolet in 1960. Collectors will pay about twice as much for the convertible today as they will for the 2-door bubble top. The 1960 Impalas included chrome dorsal wings atop the front fenders; four faux slats appeared above and below the stainless strip at the front of the fender, and faux chrome fender scoops ahead of a white stripe trimmed the rear fenders. For ’60 they brought back the three round tail lights on each side under the muted horizontal fins. They say the sweeping horizontal fins matured conservatively on the 1960 version when compared to the 1959, but they are still part of the beautiful presentation. This car looked fast just standing still. 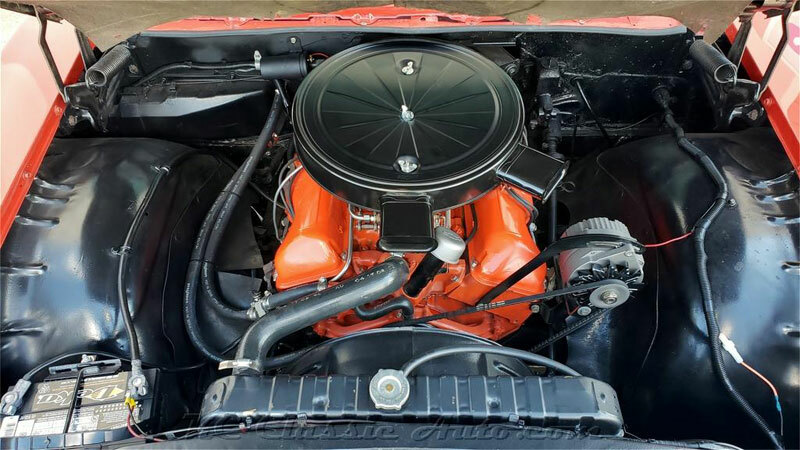 The hot engine for 1960 was once again the 348 ci V8 big block truck engine. When these big horse engine were breathing through three deuce Carter carbs, the horsepower went through the roof. There were basically two different versions of the 348 ci Tripower V8 in 1960. The 280 hp came with 9.5:1 compression. The big Super Turbo Thrust Special had 11.25:1 compression and brought horsepower up to 335. When you view the video test drive (click here for a quick review of the video) you might listen to the 348 to hear the clicking sound of the solid lifters. You might also detect the longer stroke of the lopey cam. With the 280 horsepower 348 ci V8 and a Tripower you could have had either of two automatic transmissions, a two-speed Powerglide automatic or the Turboglide. KC Classic Auto told us they were pretty sure this one had the Powerglide. 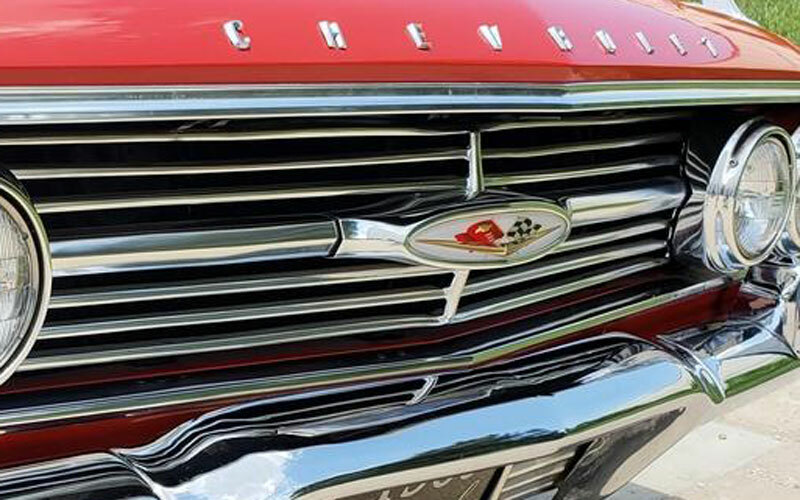 Here is how you can determine which flavor of motor your 1960 Chevrolet was born with. Look at the grille and deck-lid badges. Six-cylinder cars have a red and white crest with the Chevrolet bow tie in the center. For 283-powered cars you will notice the same crest underlined by a V. And for the 348 ci V8 cars, they have the crossed-flags above the V.